Part 2: What’s In The Box? 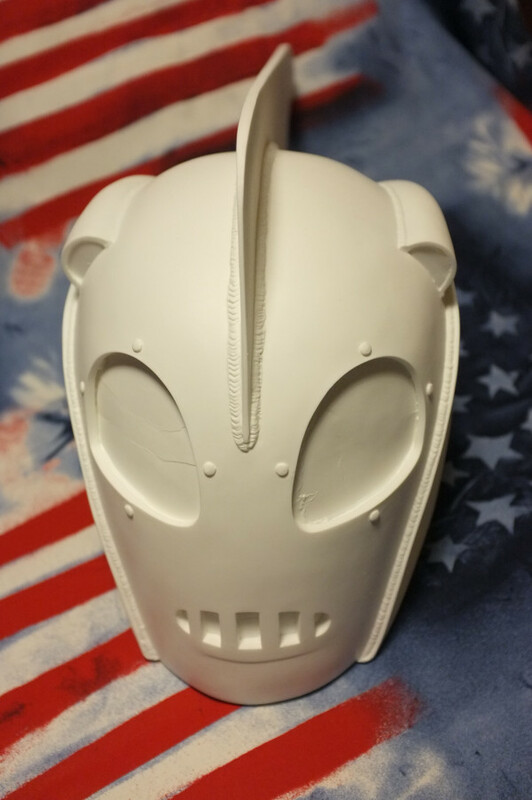 For those with a halfway decent memory, back in Part 1 of this build diary, I guestimated that it would take around 10 weeks for Monsters in Motion to get The Rocketeer helmet kit to me. The good news is they managed it in 7 weeks (ordered on 25th April, notification of shipping emailed on 5th June, delivered 12th June). Two pieces of slightly less good news though. As I mentioned in Part 1, Monsters In Motion don’t charge for your order until it ships, so between ordering and payment a slight improvement in the strength of the USD meant I got slightly less bang for my buck and the original price of £152 had increased to £160.97. I also mentioned, jokingly, the possibility that if HMRC were in a bad mood on the day the parcel arrived in the UK they might slap an additional charge on it. Well it seems that they read the article and didn’t get the joke, slapping an extra £36.29 in VAT and charges on before Parcelforce would deliver. With the total price now at £197.26 the MIM helmet might seem to be a less attractive proposition, but can it be called less competitive when there is no real competition? Yes there are fan made helmet casts that crop up on ebay now and again, but they aren’t significantly cheaper than the MIM, there are still the shipping costs to consider (most of the fan helmets are in the U.S.), the game of Custom Charges Russian Roulette still has to be played with HMRC, and it’s possible that in some cases the seller may not actually have seen the film or read the comic before creating the “accurate” helmet on offer. Before I open the box and find out if this MIM helmet kit deserves its excellent reputation, a word about the box itself. Not exactly flimsy, but not exactly that sturdy either. Certainly far from crush-proof. That said, I’ve ordered from Monsters in Motion many times over the years and nothing has ever been damaged in transit, though that may be more down to luck than the quality of the packaging material. Once inside the box, a decent amount of packing paper and those peculiar semi-inflated balloon bags surround the helmet itself. The end result is a package more reminiscent of the work of a conscientious ebay seller rather than a major retailer – I’d have preferred to find the helmet nestling snugly in cut-to-shape foam or polystyrene, especially as it’s a single piece casting with the fin sticking out there just begging to be snapped off. So what did I get for my tuppence-halfpenny short of £200? In the box is the single-piece resin helmet cast (sturdy but relatively light at 1.1Kg or around 2.5lbs), a few lines of very basic instructions printed on an A4 sheet (no illustrations), and 3 smoked acrylic lenses. Oh, and a Monsters in Motion business card. The instructions amount to “drill holes in it where there are supposed to be holes, paint it the right colour, stick lenses in the eye holes and glue them there once you’ve heated them and bent them to the right shape”. I guess the “heat and bend the lenses” part of the build is where irreparable mistakes are most likely to happen, which is probably why they send an additional lens. There’s no mention of it on the website, but I have to say I was pleased to find it in there. 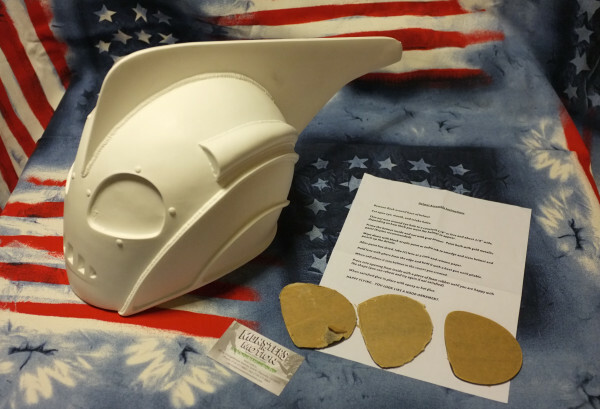 The contents of the package – resin helmet cast, three acrylic lenses with protective paper covering and the brief instructions. Anybody familiar with the wonderful and slightly peculiar world of the garage kit will be accustomed to this sparse level of instruction, but it will likely be disappointing for the Tamiya/Airfix type builder more used to multiple-angle colour box art, fully illustrated assembly instructions and nicely numbered painting guides. Okay, that’s probably overkill for a kit with only three pieces and two paint colours (gold and then black for “weathering”), but it’s worth remembering that MIM assumes that anybody buying this helmet both knows what the finished helmet should look like and has the requisite skills to make it look that way. In fairness this is a relatively basic build and shouldn’t pose too much of a problem even for a beginner, and if there are any lurking pitfalls I’m going fall into all of them over the next few weeks so you don’t have to. Back to those lenses again for a second. It’s a little disappointing that they aren’t vac-formed to the correct shape, but there’s also a positive spin available for that if you’re up for some additional customization. As the supplied lenses are standard 3mm acrylic, for around £5 and a fun-filled hour with a cutting tool of your choice the smoke lenses could be replaced with dark green ones and you’d have yourself a comic book version of the helmet rather than a film one. 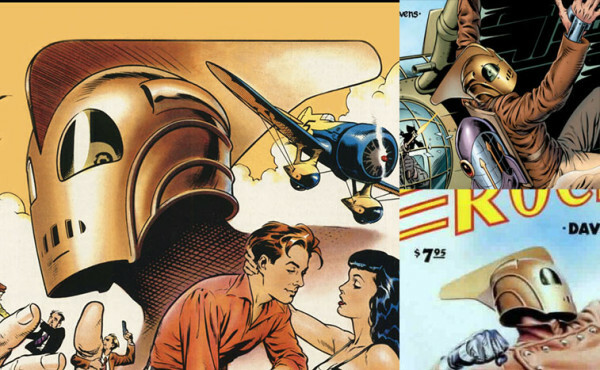 Dave Stevens’ excellent comic artwork allows for some variations in fin shape, thickness and length and how green the helmet lenses appear. The film version, and the MIM kit, has smoke lenses for the eyes and is closest to the image bottom right for fin length, but the shape is closer to the fin in the main image (which suggests that the film version was an aggregate of several of the comic versions). Now for the important bit: how good a cast is the MIM helmet? It’s good. Actually it’s very good. Edges are sharp, details are clean and crisp. Where there has been some very slight softening of detail (around the eye hole rivet heads primarily) it’s nothing that some careful sanding can’t fix. 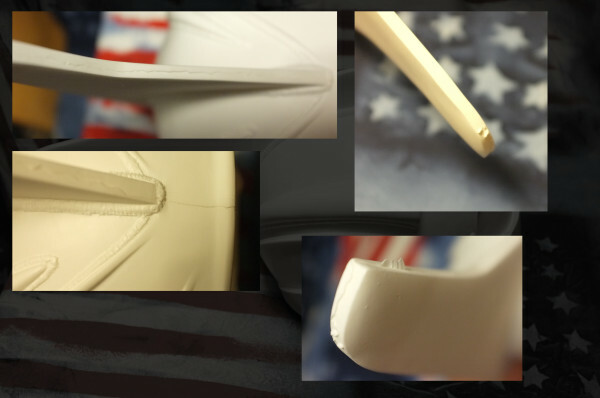 The fin is straight and true and a fairly uniform thickness, apart from the deliberately thinner area where it meets the dome of the helmet and the narrower leading edge. First impressions are that there only needs to be minimal clean-up (there’s a slight seam at the neck at the back and another that runs along the base of the fin, and also some flash towards the rear of the fin). The only place where significant filling might be required is at the very tip of the fin where a small air bubble has left a void in the resin. For this type of resin cast there’s always a certain amount of surface imperfection to sort out by sanding and filling and the MIM helmet is no exception, but I’ve seen a lot worse and if you were in a hurry to get to the painting stage you could just about get away with a light sanding and just filling that void at the tip of the fin. 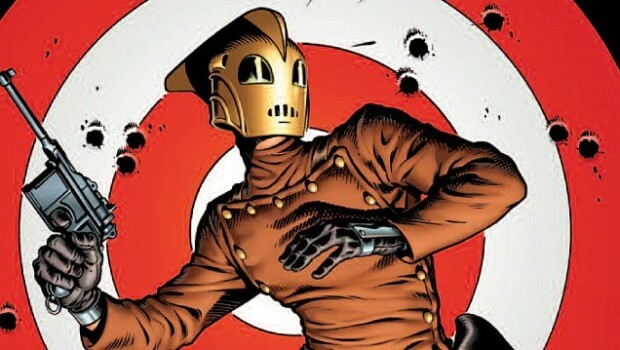 Overall a significantly cleaner and sharper cast than I’d expected, even after reading several positive reviews by other Rocketeer fans. In my defence, those reviews are all a few years old as the MIM helmet was unavailable for a while, which could have meant that the mould had reached the end of its useful life, and there’s no guarantee that a new mould would match the quality of its predecessor. The sharpness of this cast would suggest it could well be from a newer mould, and frankly I can’t imagine the previous one was any better. The seams at the back of the neck and under the fin and the flash and bubble void at the tip of the fin. This shot confirms that the resin needs to be thinned out around the eye holes and vents. Conclusion? Based on the quality of the cast and this helmet’s deserved reputation for accuracy, the Monsters in Motion kit is worth every penny of £200 (especially as that price includes getting it across the Atlantic and greasing the palm of Her Majesty’s Revenue and Customs). I’d have preferred it to have vac-formed lenses to avoid the do-it-yourself heat and shape approach, and some form of lining and a chin strap would have been nice, but at this price there had to be a few compromises. So enough talk already; time for some action. Nurse, hand me my Dremel….